So, I have a confession to make, I did not care for this week’s number for The Nail Polish Lottery Club. 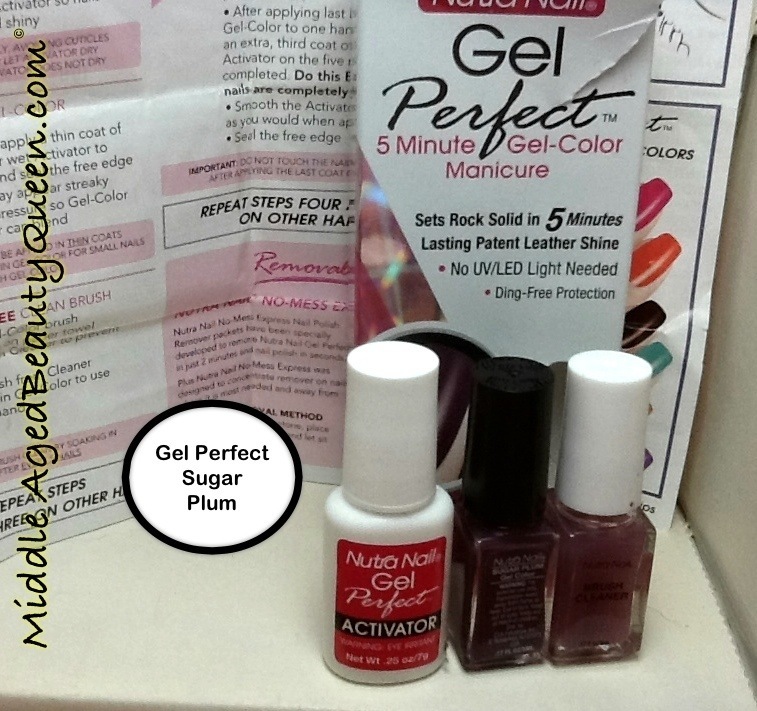 On my list for me it was this Nutra Nail Gel Perfect 5 minute Gel-Color. I was going to “cheat” and use one of the alternate numbers. The number this week is 76 with alternate numbers being 13 or 4. (Barry M Bright Pink is my #4). But I thought I’d stick with the guidelines, isn’t this the whole idea behind the #NPLClub? To use polish in our collection we haven’t used? 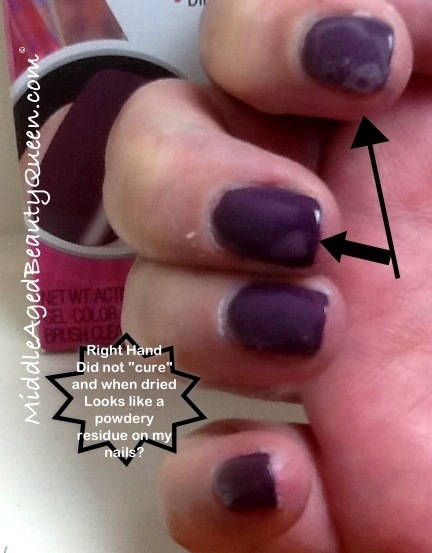 So I tried this Nutra Fail Nail. 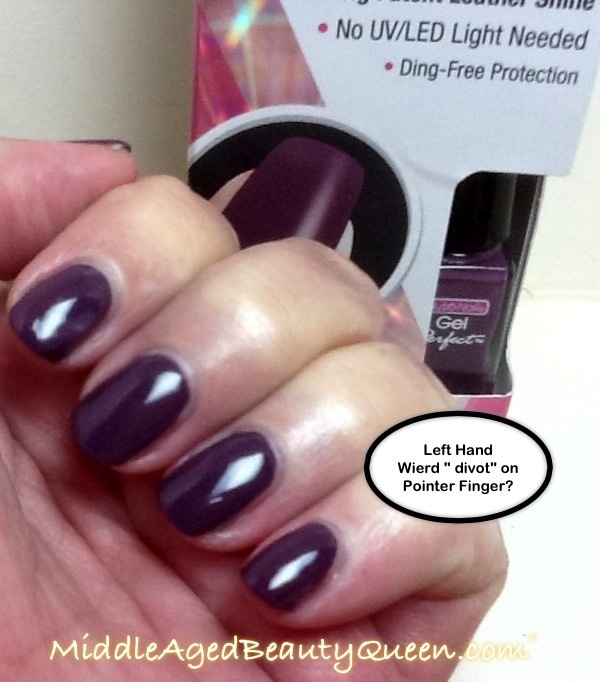 Nutra Nail Gel Perfect 5 Minute Gel color Manicure. 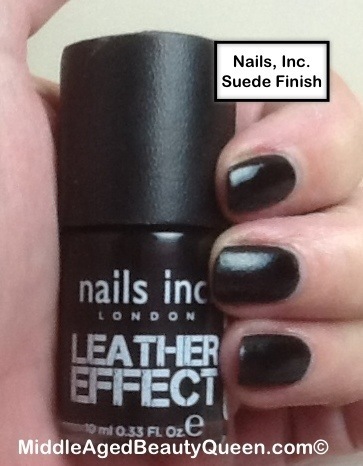 The claims on the box are: sets Rock Solid in 5 minutes, Lasting Patent Leather Shine. There is a large sheet of paper with instructions, front and back. This morning I carefully read the instructions and applied exactly as directed. First glance of my left hand and the nails look pretty good, they dried fine, they were rock solid but they also had a weird divot on my pointer and ring finger. My left hand never did dry, I even used my little UV light from Sally Hansen” and they were still mushy. When they did dry they have an ashy look to them, kind of opposite of patent leather shine, if you will. As you can see from the photos, this is not a “Rock Solid manicure, ding free and somehow I’m missing the patent leather shine. I give this kit 0/5 it was that bad. I have seen these every where I go, the drug stores of course but also the grocery store carries them. They have them in a 2 pack for $6.99 at the Canned Food Outlet. I had thought about using these on my Mom because she really does not like me doing her nails once a week. Her nails grow really fast and I thought this might be something she would like and maybe it would last longer, but I could not in all good conscience do that. I think these are a complete and utter fail. I haven’t looked yet to see what is next for #76 but I know it will be better than this mess. I wonder how long it’s going to take for me to remove this gel perfect manicure? 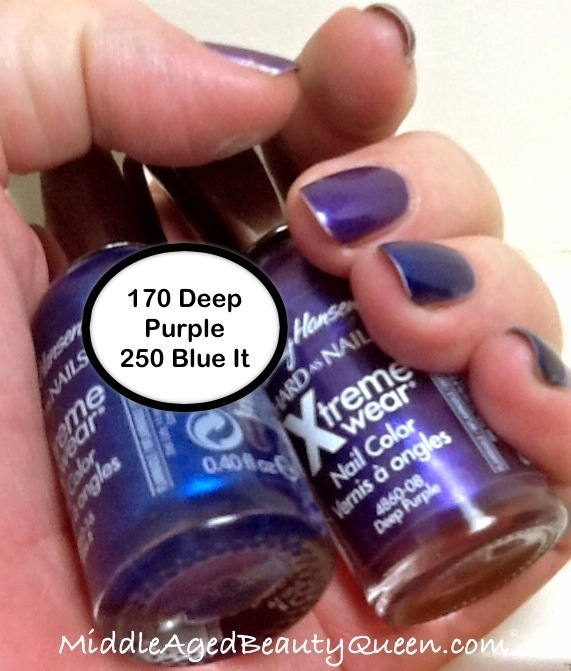 Sally Hansen Extreme Wear 170 Deep Purple with 250 Blue It half & half manicure. Talk about Blew It, I Mis-spelled it, it is Blue It. Dang, I hate that when that happens! These colors always seem to photograph as the same color but in real life they are totally different. 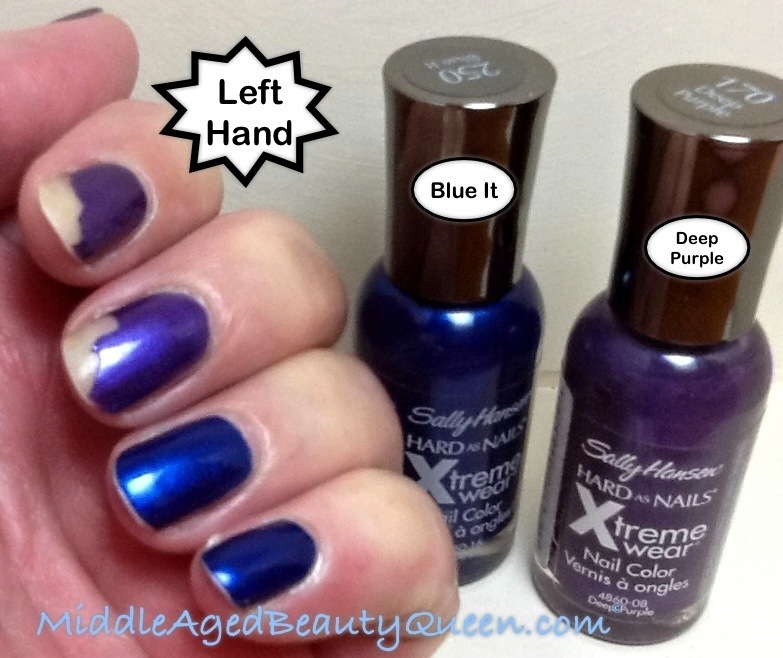 Bright purple metallic and bight blue metallic. 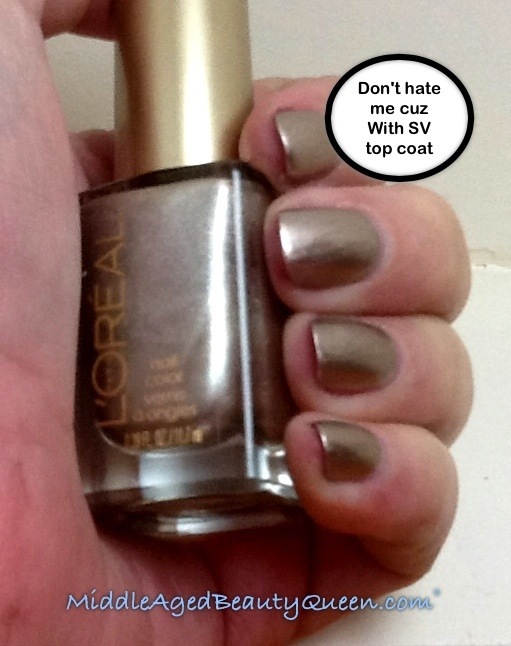 I wore these specifically because I wanted to add a matte top coat. I think they would look great. But, there’s a problem. 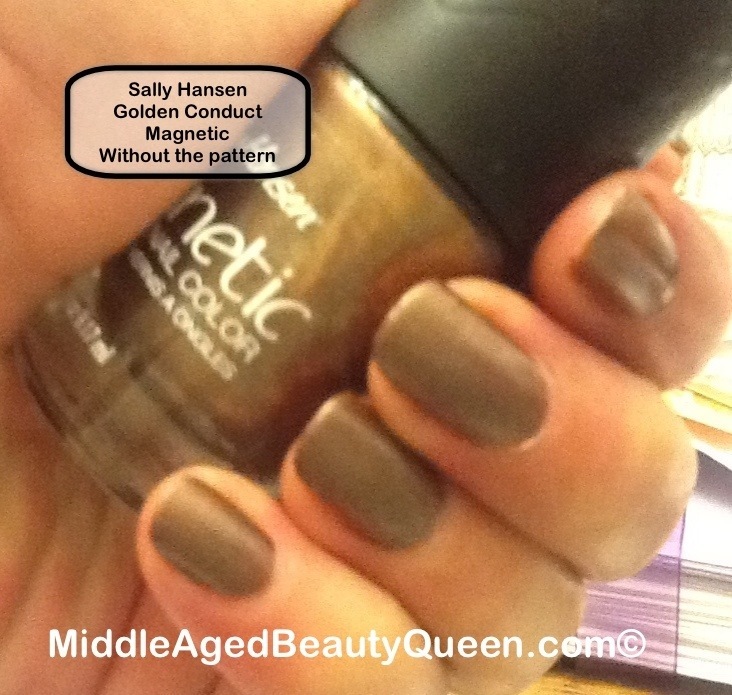 Now you all know I’m a fan of Sally Hansen nail polish, all the lines are good, affordable nail polish. I’ve had this polish on less than 24 hours and can you see the tip wear? Also, I have 2 chips, actual chips. Do you know how seldom I get an actual chip? I haven’t even done much since I painted my nails, like really I’ve done nothing but play on my iPad. Don’t judge me, I live alone, the breakfast dishes will get done sometime today, maybe, but the point is, if this “Extreme Wear” does this while doing nothing, I wonder what it would like after actual housework? I was going to take it off but maybe I’ll leave it on and update this post later on today. 💅. See you in a bit…. **UPDATE** so after a few hours, if even that of house work here’s what my nails look like. First of all let me preface by saying I did clean my kitchen pretty thorough you know how sometimes you start and you just keep going, well that’s what I did today, cleaned cabinets, under the fridge and stove all that besides the regular dishes. The only house work I did was a load of laundry. Really no big deal. These were not picked at before the pics, although I have pretty much picked all the color off. 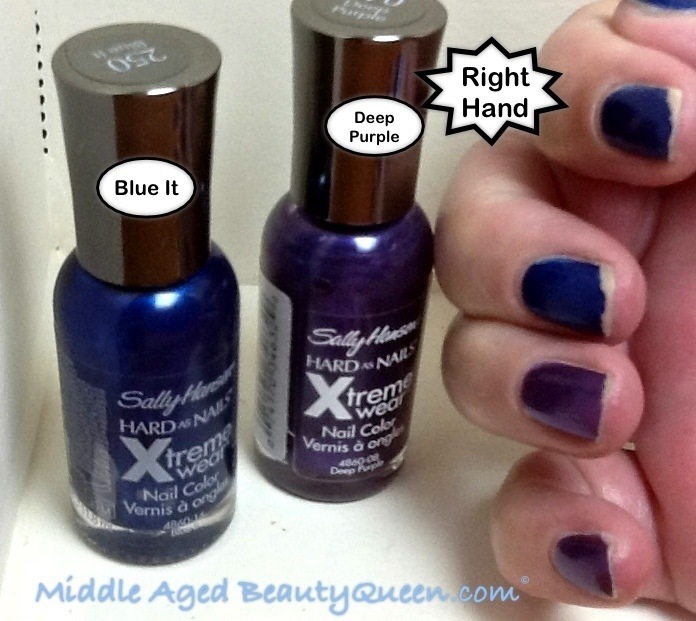 I’m not sure because I’ve had Sally Hansen Extreme Wear before with no problem. I think it is the metallic finish just does not get along with my skin chemistry, whatever. Maybe I should break up with the metallic finishes for a while, see other finishes, and maybe we can get back together another time, say around the holidays? 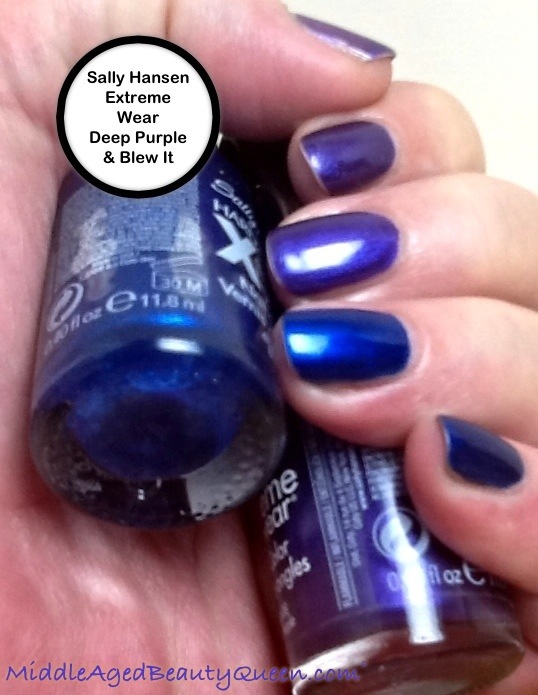 You know there are plenty of polishes in my cupboards so I’m sure I’ll find another one to love in no time at all and I’ll be saying Extreme Who?. 💅. as always, thanks for stopping by! 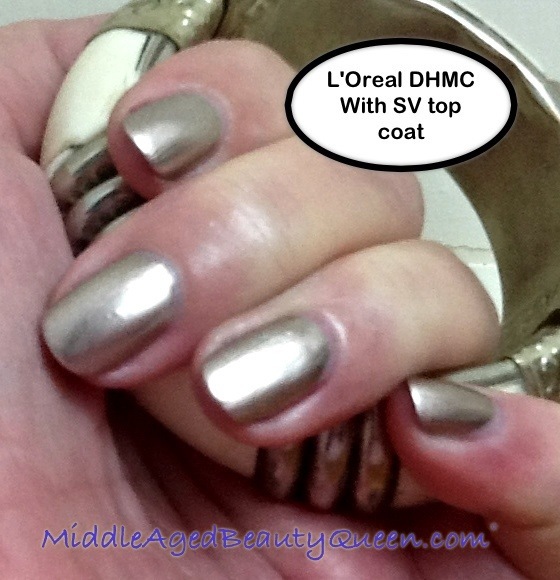 My new favorite look has been the metallic finishes like L’Oreal. L’Oreal’s don’t hate me cuz (they are named with lower case letters that is why I’m using them here, just in case you were wondering?. 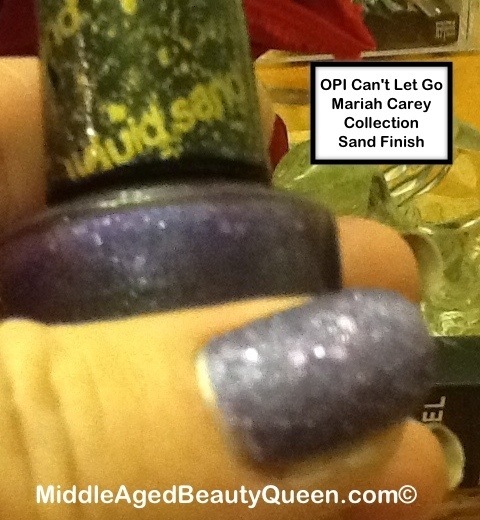 I like this polish, it has a pretty gold metallic finish. I like the formula even though it can be a bit tricky. You don’t want to work with it too much or it becomes like trying to paint gum onto your nails. Make sure you have enough polish on the brush and I use the 3 stroke method, I’m sure you all know what I’m talking about there. Because of the problem with the formula I can only give this one 3/5 stars 🌟🌟🌟. Even though I love the look once it’s done. 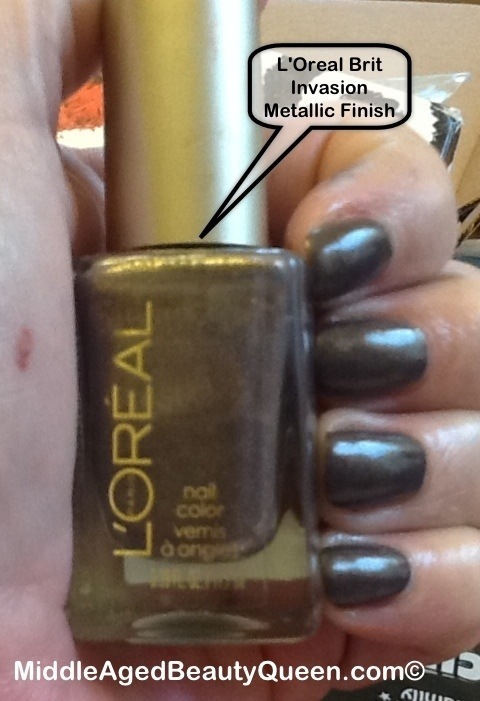 But, I really like the look of a matte top coat over this metallic finish. 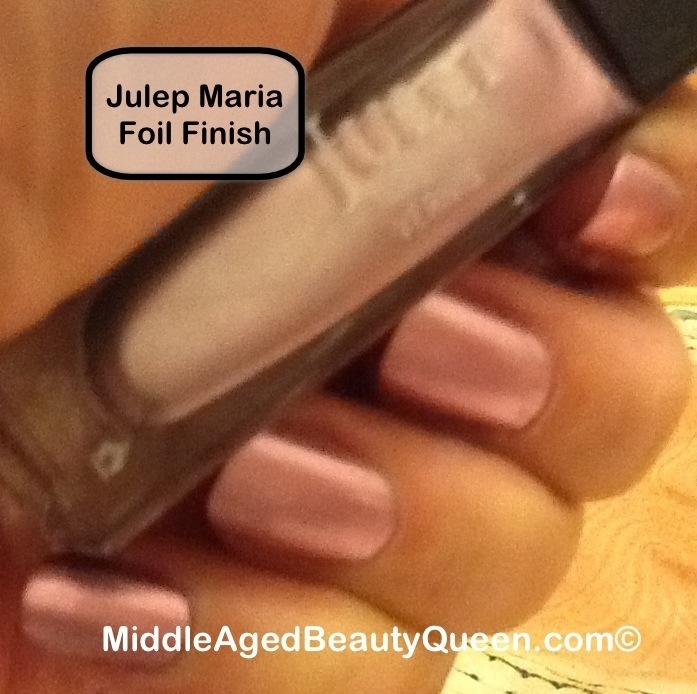 I think this changes the whole look of the polish, it gives it kind of a “satin” finish and not so metallic. I have been playing around with the matte top coats. I used the one from Nails Inc, but it took 2 coats for it to really mattify and then it’s hard to capture that in the pictures. I hope you can see the difference okay. I am going to try this in some other colors and maybe it will show up better. 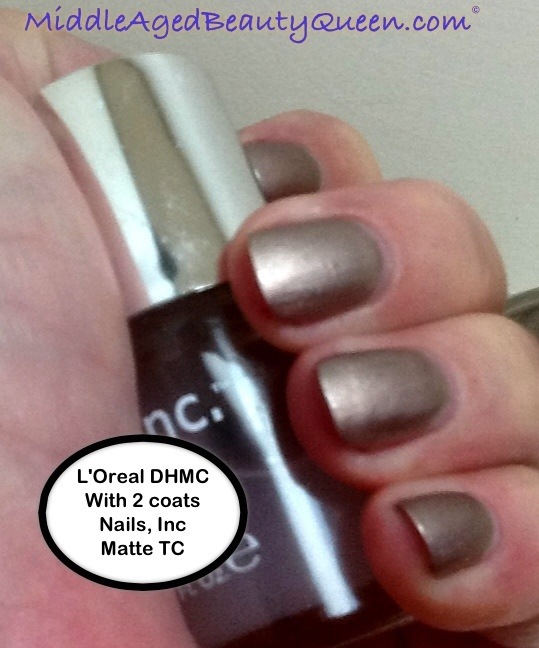 Have you used a matte top coat before? If so, which one do you like? I also have one from H & M that I thinks works better than the Nails, Inc. one. 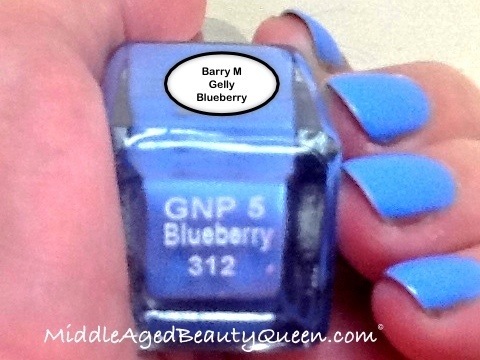 Barry M Gelly Hi-Shine in Blueberry was the pick for week 16 of the Nail Polish Lottery Club. (for those of you who don’t know about the #NPLClub go to Facebook and search Nail Polish Lottery Club, all the details are there). As you all know I seriously L-O-V-E Barry M, I think it is one of the best brands of nail polish I have tried. And I’ve tried a lot! I only wish it was available here. 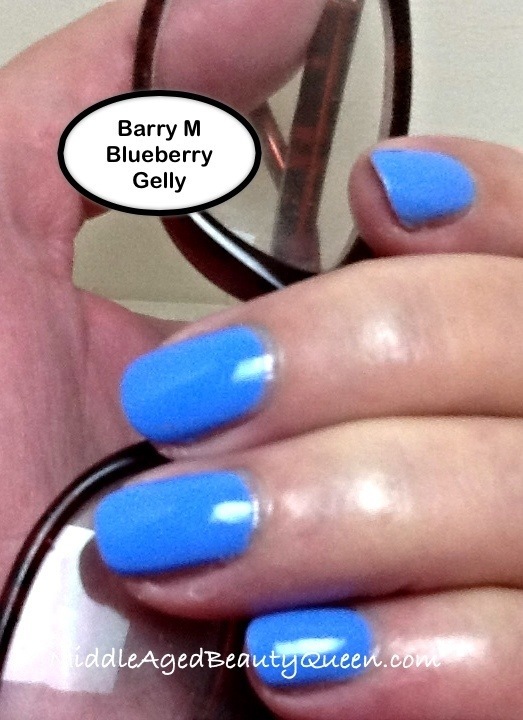 I wore this Blueberry Gelly for about 5 days, I know! A long time for me, but even when I removed it, it still looked freshly done. There was hardly any tip wear, certainly no chips and the shine was still shiny. The formula was smooth, easy to apply and I could have easily got by with 1 coat, but I did apply 2 coats along with SV top coat. I want to thank my friends in the UK, Nicky and Diana, who have sent me so much Barry M, I feel very lucky not only for the great polish but for the friendship of both these beauties. Speaking of beautiful women, Happy Birthday to the Beautiful Lori!! You make 40 look good! 😉 I hope you have a great day!!! As a side note, the Royal Mail has really cracked down on the mailing of nail polish from the UK. My friend had a package returned to her without the nail polish she had mailed and a letter warning of the dangers of mailing nail polish. I’ve read on some nail boards that people have ordered from Illamasqua and never received the polish but instead received a letter from the Royal Mail telling them the NP had been destroyed. Keeping all this in mind, you can order from the Barry M website and they will ship to the US. I ordered 6 nail polishes and the total, including shipping was $58. That is less than $10 a bottle, I received my package in 4 days, so I was very happy. The shipping is a flat rate of £20, so if you and a friend placed an order you could bring the priced per bottle down. 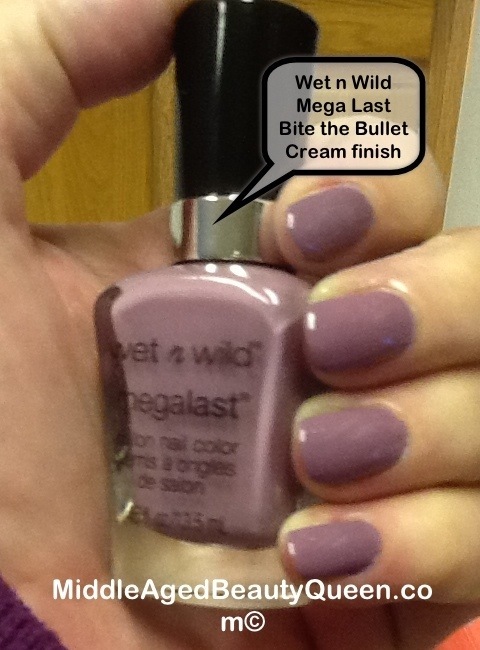 You can also order Barry M from Ninja Polish. Their prices are from $6.50 to $10 per bottle. I did a “fake” order of 6 bottles and it was right around $50 so they aren’t that much cheaper than going through the Barry M site. The Ninja site also carries Model’s Own, A England and a lot of Indy brands so it is worth taking a look at if you are interested in polish from the UK. Ashley just had her hair done and didn’t like it, I think she looks adorable, even with that puss of a face on!. Sorry Ash, you know I love you more than my luggage! Just What is a Jelly Nail Polish? And Other Finishes…..
My favorite type of finish is a straight up cream. For full on glitter, I really like this one from Bigmouth Lacquer, you can find them on Etsy. I like this one because it’s a “Crelly”, which is part cream finish, part jelly. More and more I have been seeing new releases of polish with a bit of a frost finish. These seem a little old fashioned to me, but I like them. The latest trend this spring has been the sand finish or the matte sparkle-y finish. I’m not so sure about this trend. Have you tried it? I’d love to know what you think of it. Then of course we can’t forget the magnetic finish, even though I would like to. I have one magnetic polish, the gorgeous Diane was sweet enough to send me. I like the polish way better without the magnetic effect. Again, if you’ve tried this trend I’d love to know your thoughts on it. Another newer finish, this was sent to me from my friend Diana who lives in London. Otherwise I would never had the chance to try, and that is the suede or leather finish. I like this one, a lot! So, these are just a few examples of some different finishes. I know I didn’t cover them all but bear with me, sooner or later I will get to the rest. What is your favorite finish? My favorite still remains the plain old cream finish. Even though I really like the micro-glitter, duo-chrome and suede look as well. What’s a girl to do? I know! Keep Calm and Paint Your Nails! Tags: cream finish, cream finish nail polish, Crelly nail polish, different finishes of nail polish, duo-chrome nail polish, metallic finish nail polish, micro-glitter nail polish, new trends of nail polish, What is a jelly polish? 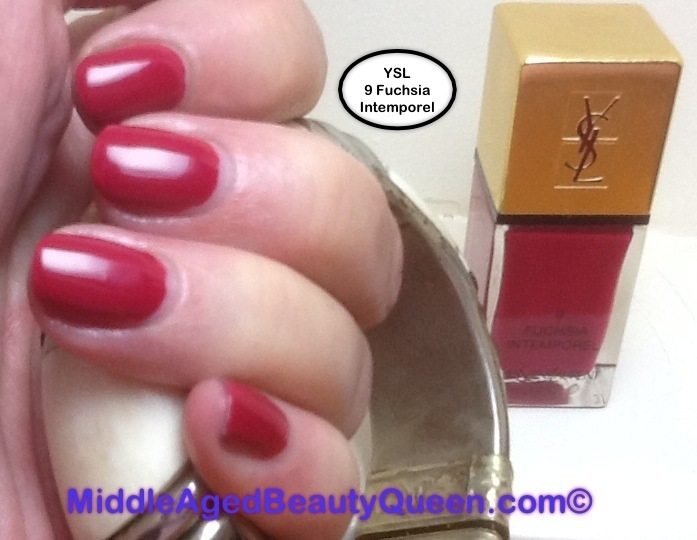 YSL 9 Fuchsia Intemporel is a great change from all the blue polish I’ve been wearing lately. The 9 Fuchsia Intemporel is more red than fuchsia but it is very pretty and lady like. I never used to like red polish and now I do, think it is a classic and every woman needs that perfect red polish in her life. Is this that perfect red? For me, no. The formula is very smooth, easy to apply with no issues whatsoever. The brush is a smaller flat brush which makes application quite easy. Dry time was very fast, and all in all I like this polish very much. I’ve had it on a couple of days and there is no sign of tip wear. Which for a red this dark, that is pretty amazing. 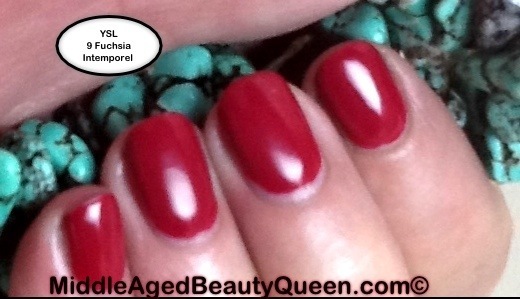 I think this is a very good polish, just not my favorite red. I bought this polish in a set of 3 from Nordstrom $60 for the set. Which puts this at $20 per bottle, containing .34 oz. 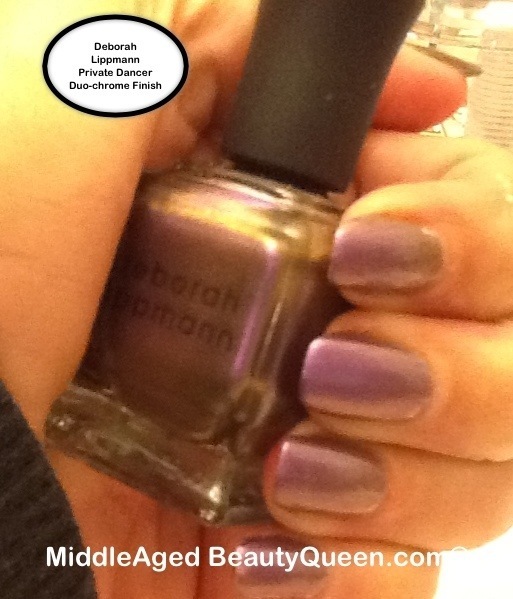 for me, this is a high end polish and I expect the formula to be great and I wasn’t disappointed there. The only thing that was a disappointment, if you could even call it that, because it really wasn’t all bad, but I expected the fuchsia color to be more of a pink, than a red. 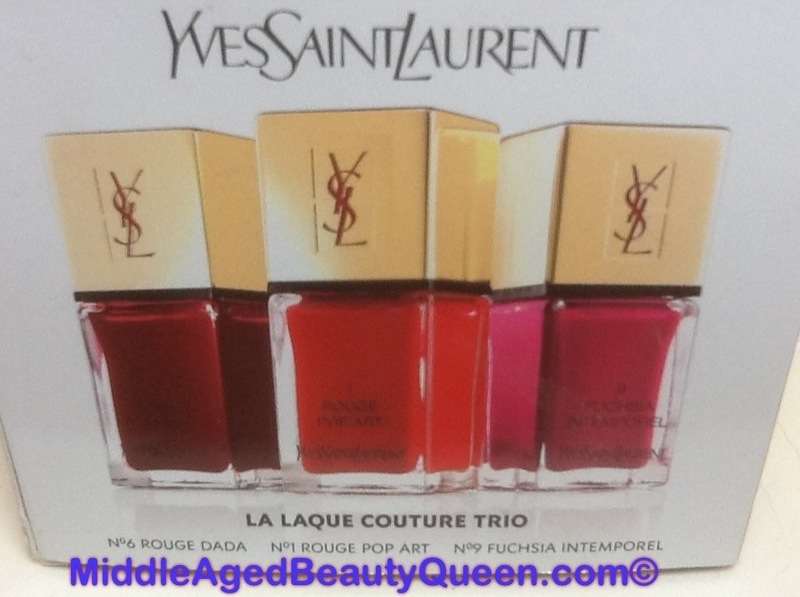 When I bought this set I knew it had a bright red (1 Rouge Pop Art) and a darker red (6 Rouge Dada) and then the “fuchsia” which is really a red. 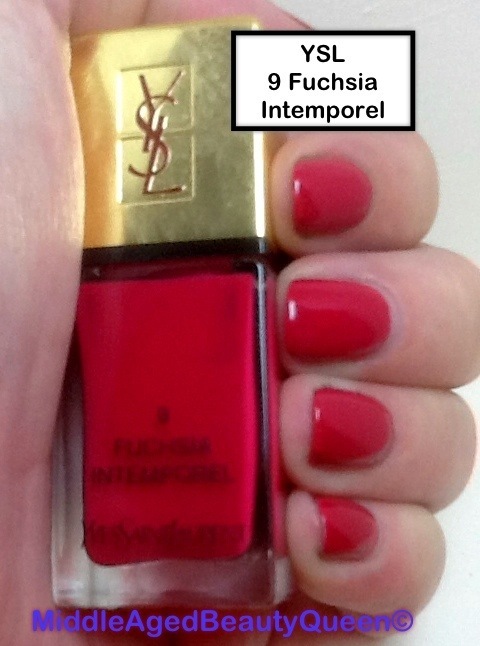 YSL 9 Fuchsia Intemporel is a pretty color and it is a nice break from all the blues I’ve been wearing. I would give this set 4/5 stars 🌟🌟🌟🌟 only because of the fuchsia being another red. If you’re curious Intemporel means timeless. My favorite red is still Dragon from CHANEL, there is something magical about that polish and I’m pretty sure it will always be my favorite red. What is your favorite red? Have you seen this? I had not heard of this but I had to try it! I found this at TJ Maxx for $3.99. Good or bad mascara, that is a good price. 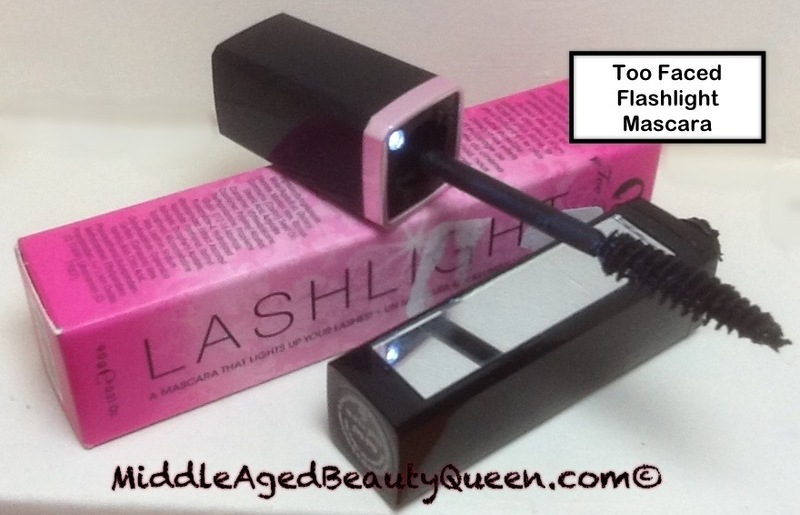 Too Faced Flashlight Mascara. There is a button on top of the wand that lights up. To tell the truth, the light was a bit annoying. But I was using the mascara in the morning in My fully lit bathroom. I guess if you needed to apply your mascara in a movie theater? The flashlight would be handy? I’m having a hard time wrapping my head around a lit up mascara. Besides the annoying light, it applied great, but at the end of the day it has flaked off my lashes onto my cheeks. Imagine my surprise when I looked in my car mirror after a Doctor’s appointment and all my mascara was on my cheeks. 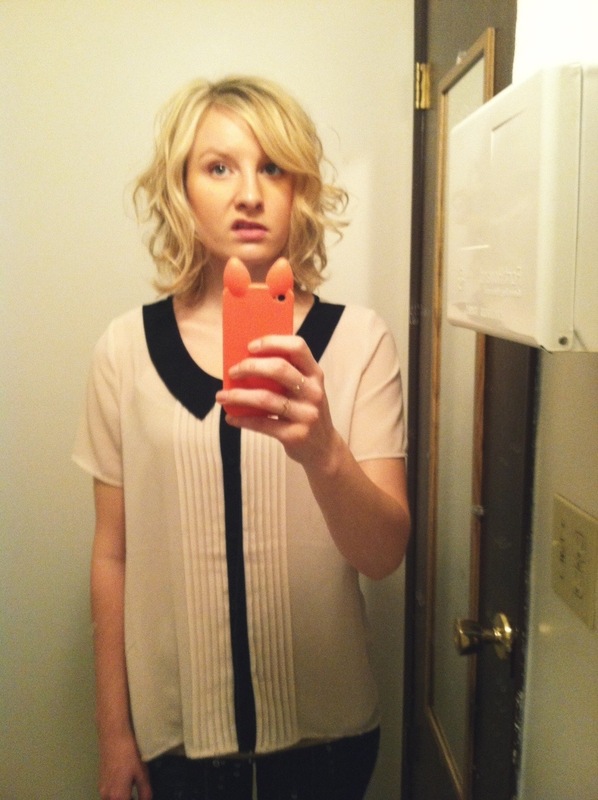 I looked like a crazed woman. (Insert your own joke here). I gave a star for price and a star for having a mirror attached that actually would function, if needed in that movie theater.